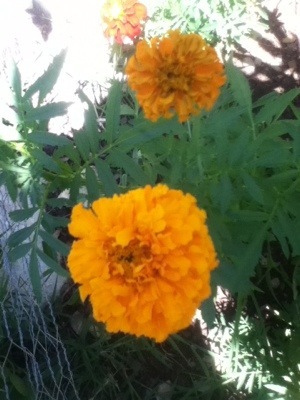 I have to admit that I didn’t use to think much of marigolds. I think that I sort of grouped them with dandelions in my mind. In my defense, this was before I had a garden, and flowers were not something I spent a whole lot of time thinking about. Then I saw the Mira Nair film, Monsoon Wedding. It’s about a Punjabi wedding, and there must be about a hundred thousand marigolds in the film. Someone even puts a whole one in his mouth and eats it. Suddenly, I saw marigolds slightly differently. That was about ten years ago, and in the intervening years I have come to appreciate many qualities of the marigold. They are generous and free-flowering; they are unfussy and forgiving; they are pest control allies; and of course, they are a lovely burst of color, available in all sorts of varieties. And here’s to all the unsung beauties out there, and hoping that somebody sees you for what you are. They are supposedly useful for keeping unwelcome bugs away… we always plant them among our vegetables… don’t really know whether it helps but they look so cheerful! At the very least, they keep the garden looking cheery! The more tenacious, unfussy flowers are undeservedly overlooked. Oh and daisies, another unsung beauty of the garden! I planted some nasturtiums in among the vegetables for the same reason and they became a hotbed of caterpillar activity. I wondered if they kept them happy and therefore off their neighbors or if they were just more food for the caterpillars. Either way, I like having them. 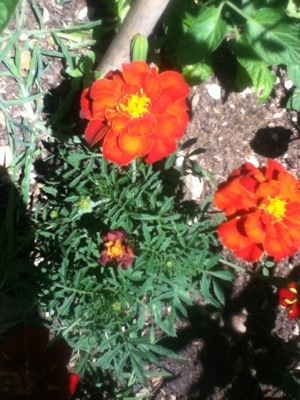 You have reminded me that I need to plant some marigolds in my vegetable garden to help with the pests. It always makes me happy when our posts remind one another to do little garden chores. Some people find them stinky, but I think they smell good too! 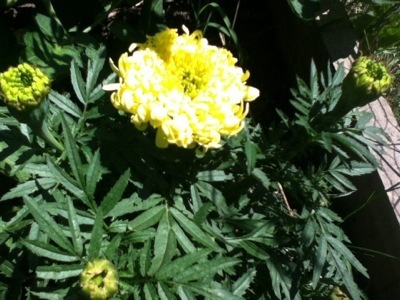 I always sow marigold seeds, plant half of them and give the other half to neighbours. What I can’t give away, I donate to the compost heap. I have a tendency to over-sow seeds every year! Pity that my neighbours aren’t green-fingered sorts. BTW, I think it’s French Marigolds that work best for discouraging aphids but I’ll check in my Companion Planting book by Bob Flowerdew.